We’re pretty sure that men don’t experience quite the same prevalence of depression and/or anxiety as women in the perinatal period, but it’s not an easy thing to be confident about. A lot of blokes use blokey ways of dealing with unwanted emotions: a bit of quiet, brooding silence, a bit too much booze, working-like-a-machine, carrying-on like a pork chop, maybe being there but not really being present (if you know what I mean)… y’know, that sort of thing. It is guesstimated that about 10% of men will experience depression at some time in their lifetime, and one of the most likely times for men to develop depressive symptoms is in the first 12 months of becoming a dad. New dads, like new mums, can feel exhausted, overwhelmed and marginalised – a combination that would make anyone struggle to feel valued. When we’re thinking about perinatal mental health, we should think about men too. So with that in mind, and with the knowledge that Men’s Health Week is just around the corner (starts June 10th), it’s good to see that the Raphael Centres team are going out of their way to celebrate the role of blokes with kids. The Healthy Men, Healthy Minds competition asks men, women and families to submit a photo which has been inspired by, or is reflective of, positive relationships between children and a significant male in their lives. There will be a public vote to decide the winning photo (prize = iPad Mini). For more info go to the Raphael Centre website (here), or to enter go straight to their Facebook page (here). Apart from the possible pay-off of scoring a whizzy gadget, it will be good to see blokes and kids recognised amongst the photos that are starting to appear on this Facebook site. 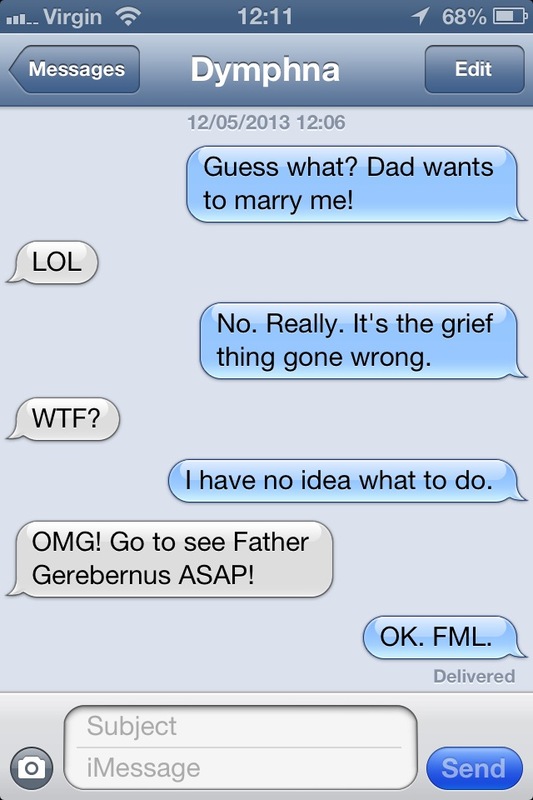 If you know of a new dad who’s struggling a bit, but is feeling a bit reluctant to see someone, give him a nudge to visit the website and/or phone either MensLine or mindhealthconnect or PANDA – there are supports out there for blokes, they’re just not always obvious. This entry was posted in Blog and tagged Perinatal Mental Health on 30 May 2013 by Paul McNamara. 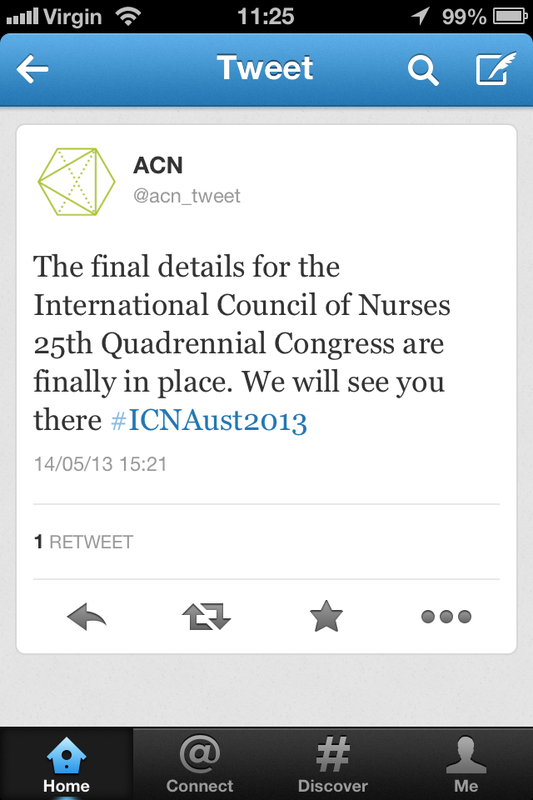 The International Council of Nurses (ICN) 25th Quadrennial Congress was held in Melbourne from 19th May 2013 to 22nd May 2013. The conference was extended by a day each side: on 18th May there was a student assembly in the morning and the opening ceremony in the evening; on 23rd May professional/facility visits were scheduled. 1. To advance and improve equity and access to health care. 2. To demonstrate the nursing contribution to the health of individuals, families and communities. 3. To provide opportunities for an in-depth exchange of experience and expertise within and beyond the international nursing community. 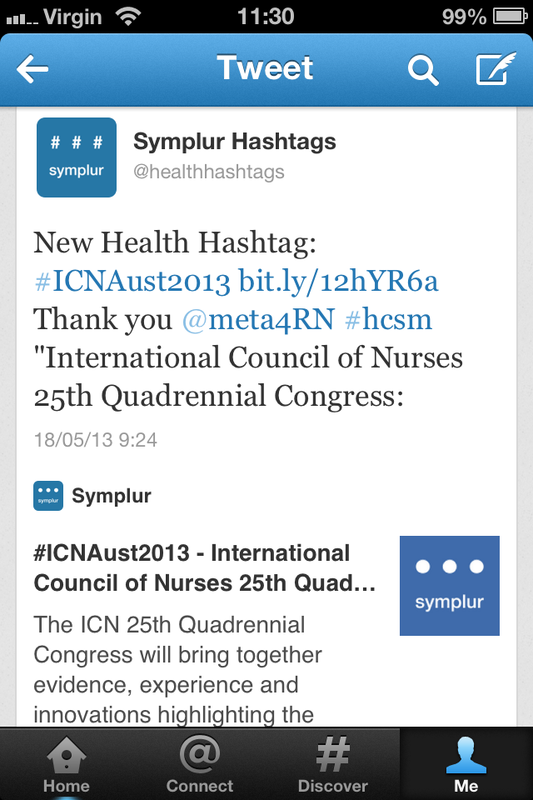 It is with objective number 3 in mind that we now look back at the ICN 25th Quadrennial Congress through a social media lens; specifically, we will examine the use of the Twitter hashtag #ICNAust2013 at this major international nursing conference. 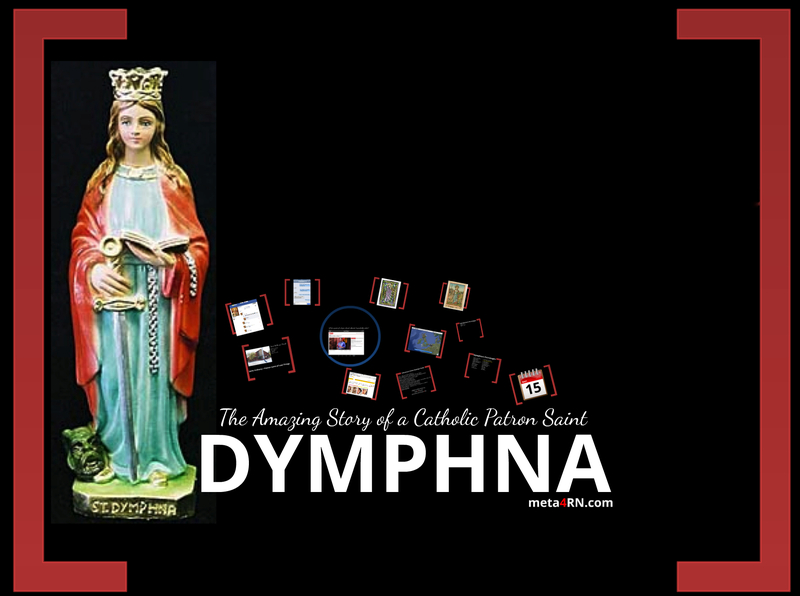 Quantitative data has been collated by the Symplur Healthcare Hashtag Project. I can’t speak too highly of Symplur’s website/service. There are other Twitter aggregation tools available, but it would be hard to beat the simple-to-set-up and beautiful-to-look-at combination that Symplur offers: sample. 210 of the 288 #ICNAust2013 participants. 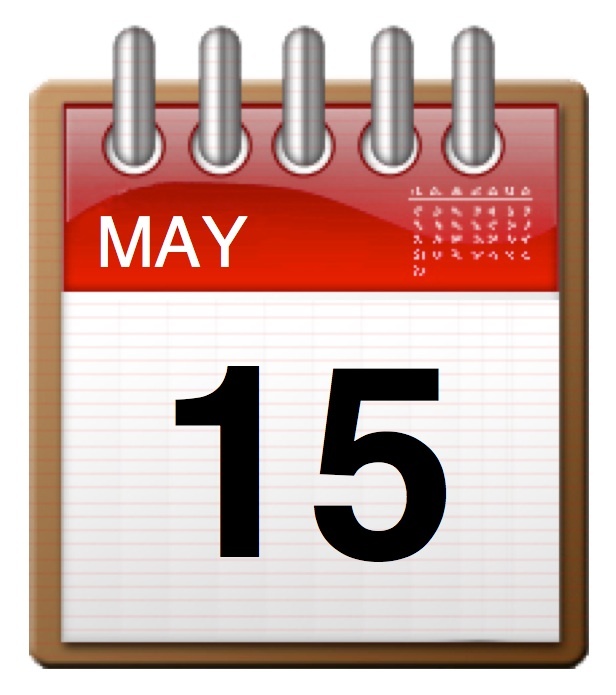 The time period for data collection has been set from midnight commencing Tuesday 14th May 2013 to midnight ending Thursday 23rd May 2013, Melbourne time (the conference host city). In social media terms, the days/weeks/months leading-up to a conference are vital for establishing the use of a specific Twitter hashtag to enable all participants and interested lurkers to share their ideas easily (more about this later). In the days leading-up to the conference (Tuesday 14/05/13 to Friday 17/05/13) there were 58 #ICNAust2013 Tweets by 22 participants. This developed a bit of a buzz/publicity, allowed some consistency in establishing the hashtag, and the promoted the development of a “core community” of conference Twitter participants. A few of those pre-conference #ICNAust2013 participants went on to be the most active and most mentioned of all participants. 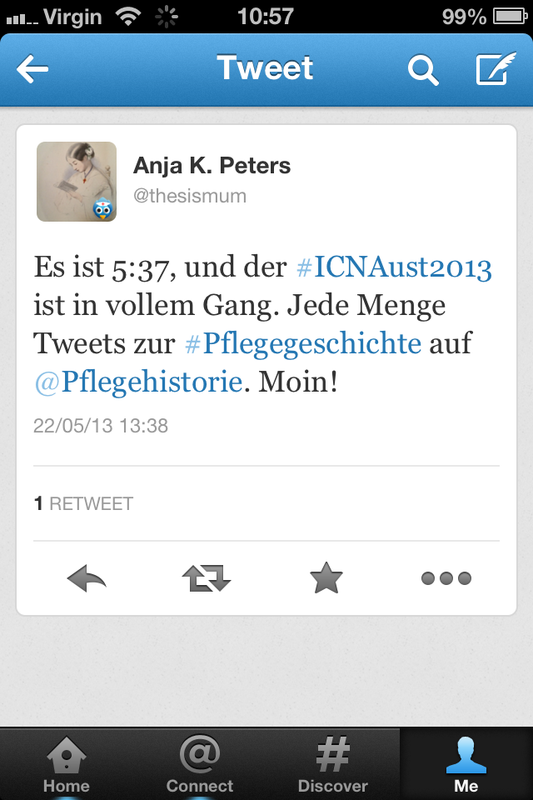 Use of the #ICNAust2013 hashtag started to explode on the morning of Saturday 18/05/13 – the same time as the student assembly. From morning to 1.00pm on Saturday (Melbourne time) 111 Tweets had been sent by 26 participants (source). 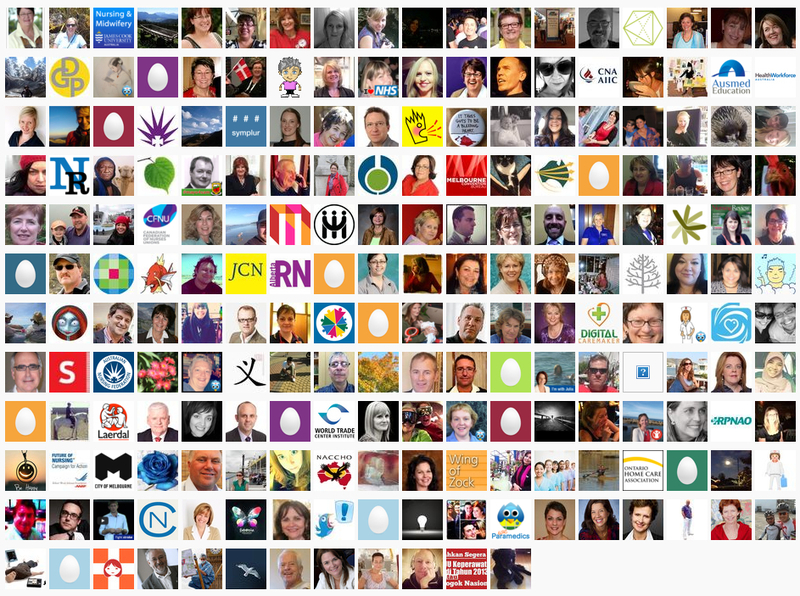 By midnight that night, after the opening ceremony, there were 259 #ICNAust2013 Tweets and 49 participants (source). The scene was set: it was clear that the ICN 25th Quadrennial Congress was not going to be restricted to the walls of the Melbourne Convention and Exhibition Centre. This conference was going online in real time via nurses using Twitter. Over the ten days being examined (14th to 23rd May 2013) 288 individual Twitter participants used the #ICNAust2013 hashtag, collectively generating 3973 Tweets. 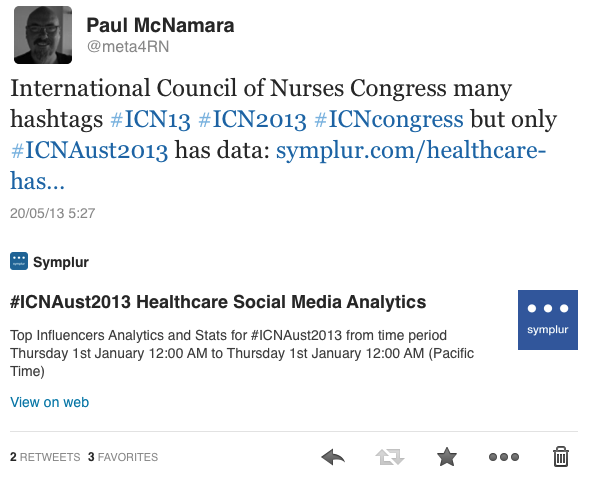 In the examined period, the least number of #ICNAust2013 Tweets per day was 1 – on Wednesday 15/05/13. 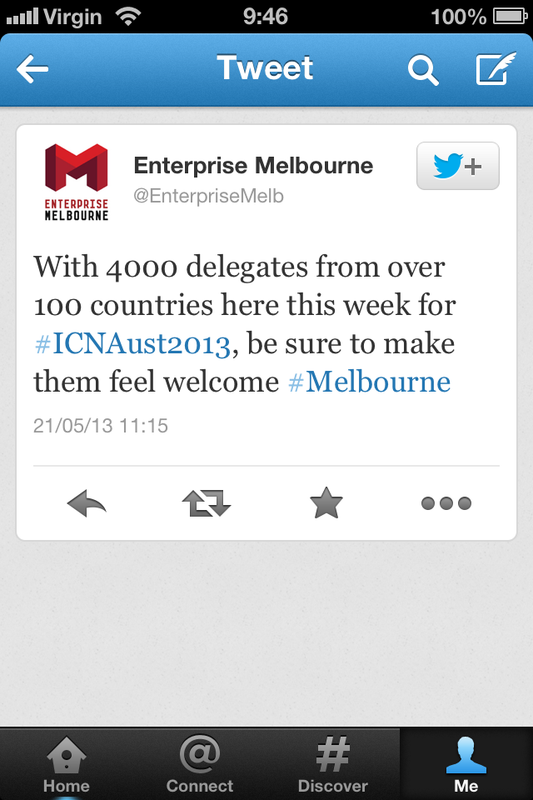 A week later, the highest number of #ICNAust2013 Tweets in a day was attained: 1052 on the last day of conference – Wednesday 22/05/13. Over 900 Tweets were sent on two other days: Monday 20/05/13 and Tuesday 21/05/13. In the examined period, the least number of participants was 1 – on Wednesday 15/05/13. 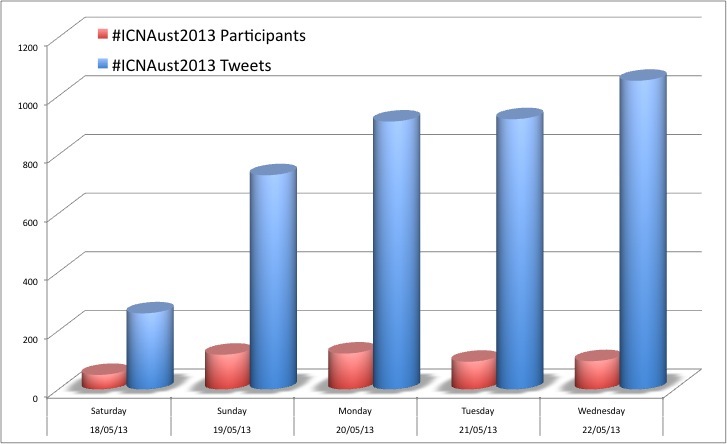 The highest number of participants in a single day was on Monday 20/05/13 when 122 individuals sent Tweets using the #ICNAust2013 hashtag. A similar amount of people, 118, used the hashtag on day one of the conference, Sunday 19/05/13. Predictably, the vast majority of #ICNAust2013 activity occurred over five consecutive days: from the student assembly on the pre-conference Saturday and over the four days of conference sessions. During that period, 3875 #ICNAust2013 Tweets were sent – over 97% of the total (source). Over the 10 days being examined, the #ICNAust2013 hashtag had the possibility to be viewed up to 1,836,486 times – aka the “Tweet Reach” (source). The “Tweet Reach” or “impressions” is a metric for how many impressions a healthcare hashtag has made in users’ tweet streams. Symplur computes total impressions by taking the number of tweets per participant and multiplying it with the number of followers that participant currently has. This is done for all participants in this time period and then finally the numbers are added up (source). I feel very cautious about interpreting this number literally – to do so would be to exaggerate actual impact. That said, it does give an illustration of the capacity of Twitter to spread information to a very large audience. Symplur gives us a “leader board” of the top ten most active #ICNAust2013 participants. It is noteworthy that in the top ten [seen here on the right], five of the participants are from one school of nursing: James Cook University in Far North Queensland. Between them these five prolific Twitter accounts sent 1225 Tweets using #ICNAust2013, accounting for over 30% of activity. Also noteworthy is that one participant – @Laurie_ENL – is part of the emerging nurse leader program run by the Australian College of Nursing (ACN). Another participant – @santemondial – is a Committee Member of the ACN’s New Generation of Nursing faculty. Related to this, @debracerasa was previously the CEO of the Royal College of Nursing Australia (RCNA) – the precursor to the ACN, her ongoing interest in promoting nurses and nursing is clear. These three participants were instrumental in starting off the #ICNAust2013 “Twitter storm” the morning before the conference. The top ten of most prolific #ICNAust2013 participants included only one non-Australian – @ruthft1 – a Professor of Nursing and Deputy Dean visiting from the United Kingdom. The only male on the leader board was @PDarbyshire – the 2012 Social Media Nurse of the Year who leads research and practice development projects internationally (more info about Philip here). It is interesting to note that once the conference was underway use of the #ICNAust2013 hashtag became a 24 hour-a-day activity, as illustrated below (source: Symplur]. This chart takes a snapshot of one 24 hour period (Tuesday 21/05/13, Melbourne time), and clearly illustrates that although the majority of activity occurred during daylight hours while the conference sessions were underway, use of the #ICNAust2013 happened outside of conference hours too. Scanning through the transcript it becomes clear that there are two reasons for this 24 hour coverage. Photos and quips from social activities in the evenings after the “business” of the conference was finished were shared by delegates using the #ICNAust2013 hashtag. Overnight and in the early hours of the morning conversations started in the conference in Melbourne were elaborated on, responded to and shared by others all over the world. 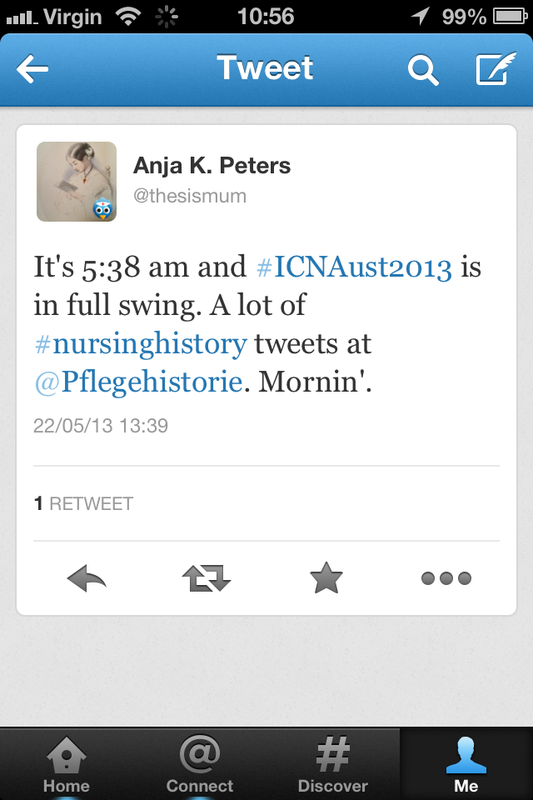 Some German nurses with an interest in the historical aspects of nursing were especially interested-in and active with using the #ICNAust2013 Twitter hashtag. 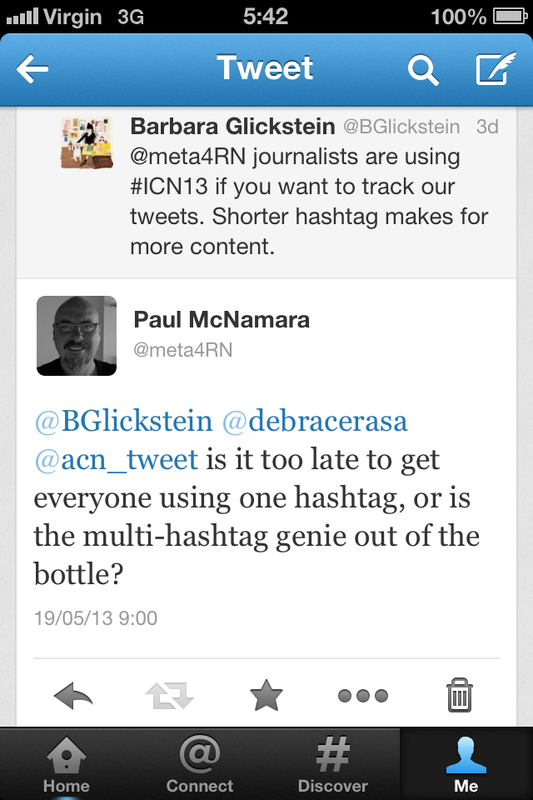 The day after the conference ended there was still some #ICNAust2013 use: 40 tweets by 23 participants (source). 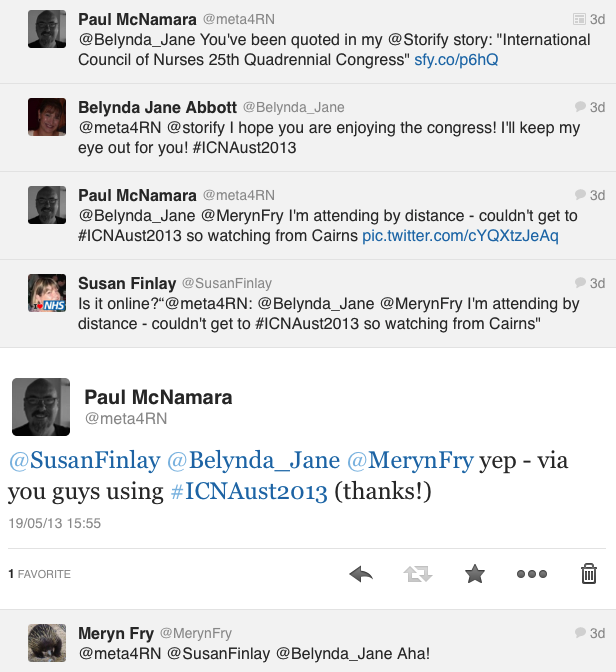 I was intrigued to see that for some participants their first and only #ICNAust2013 Tweets came after the conference had ended. Just think about this for yourself for a moment: for the conference organisers, which of these periods was the most crucial time for using the #ICNAust2013 Twitter hashtag? My answer is a bit further down under the subheading Lessons for Conference Organisers. For qualitative data purists, the entire transcript of Tweets using the #ICNAust2013 hashtag between midnight commencing Tuesday 14th May 2013 and midnight ending Thursday 23rd May 2013 (Melbourne time) is available here. As with the quantitative data, this qualitative data has been aggregated by Symplur’s Healthcare Hashtag Project. For those not interested in scrolling through all 3973 Tweets, two curated extracts are presented. On the last morning of the conference Joseph Proietto presented the keynote “Obesity: Personal or Social Responsibility?” Using the #ICNAust2013 hashtag, nine participants Tweeted the relevant points of the keynote as they each interpreted them, along with their reflections and thoughts. 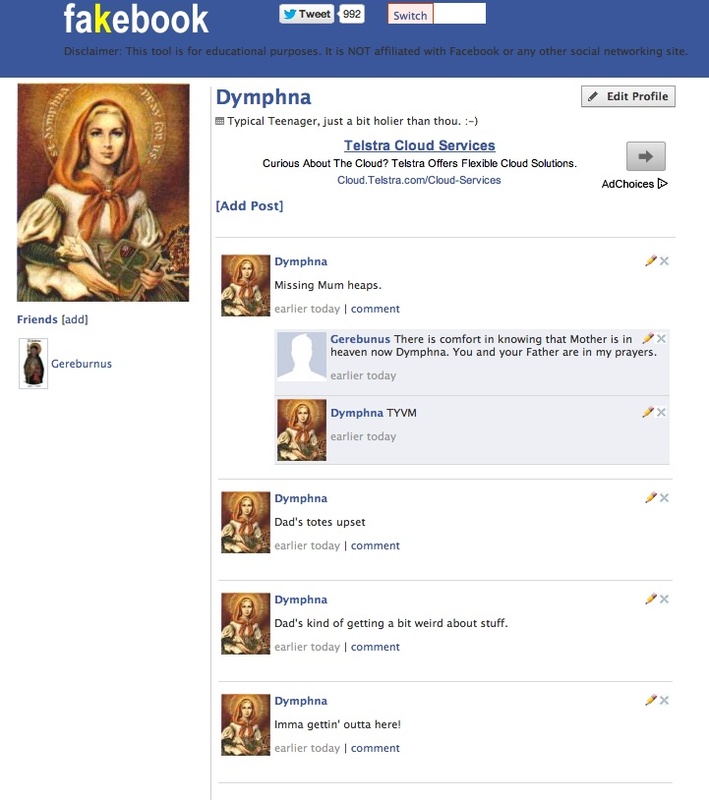 I know this has been a long read already, but please please please take 5 minutes to read through this curated excerpt – it is a charming demonstration of how social media can be used professionally and in an entertaining, personable and enlightening manner. It’s my favourite thing to come out of the conference. I think the International Council of Nurses (ICN) 25th Quadrennial Congress was a success in social media terms, but it could have been better. There was no announcement of a Twitter hashtag on the conference website and the ICN has had no participation on Twitter at all. The Australian College of Nursing’s Twitter handle – @acn_tweet – took the lead in using and promoting the #ICNAust2013 hashtag but, with 200 or so followers, didn’t have the penetration to get it firmly established with everyone before the conference. As far as I could find, no planning had been done into measuring or aggregating the #ICNAust2013 Twitter feed before the conference; remember, this is a conference that promotes and values research. It costs nothing to use Symplur’s Healthcare Hashtag Project and only takes a few minutes to set-up. Social Media lacks hierarchy , so it does not matter if somebody 4000km away from the conference with no formal links to the organisations conducting it becomes the person to report on it. However, I don’t have a mandate to do so – it’s something that should have been planned by the conference organising team well in advance. I set-up this page on the Saturday morning as the student assembly was getting under way; that’s cutting it fine – it would have been better to have this in place early in the planning stages. The #ICNAust2013 hashtag had good uptake amongst Australian nurses, but was less successful in gaining traction with international delegates and invited guests. This is important because key delegates, keynote speakers and politicians often have many thousands of Twitter followers, so can popularise a Twitter hashtag and raise awareness of an issue or event to a broad audience very quickly. There is a good argument to be made for brief-as-practical conference hashtags, but it is pretty common to use the full four digit year. Two characters either way doesn’t really matter – what is most important is to decide on a Twitter hashtag then promote the hell out of it. Use the hashtag at every opportunity in the lead-up to the conference (this is the most important time), on the printed material given to conference delegates, and on the projected slides used at the beginning of each day/session of the conference. It probably doesn’t matter if you do something different if you make sure that you really pump the publicity so everyone knows – the visiting politician/dignitary, the keynote speakers, your members, your speakers and, most importantly, all of your conference delegates. The conference delegates are the unsung heroes who generate the content in the twitter stream and promote your organisation-event-cause-brand; conference organisers owe them the courtesy of making it easy and rewarding to do so. Ambiguity and inconsistency with Twitter hashtags dilute the power and reach of social media. As the quantitative and qualitative data presented above show, #ICNAust2013 contributed towards the conference objective “To provide opportunities for an in-depth exchange of experience and expertise within and beyond the international nursing community”. Had everyone using social media at the conference used just one hashtag it would have been even more successful. 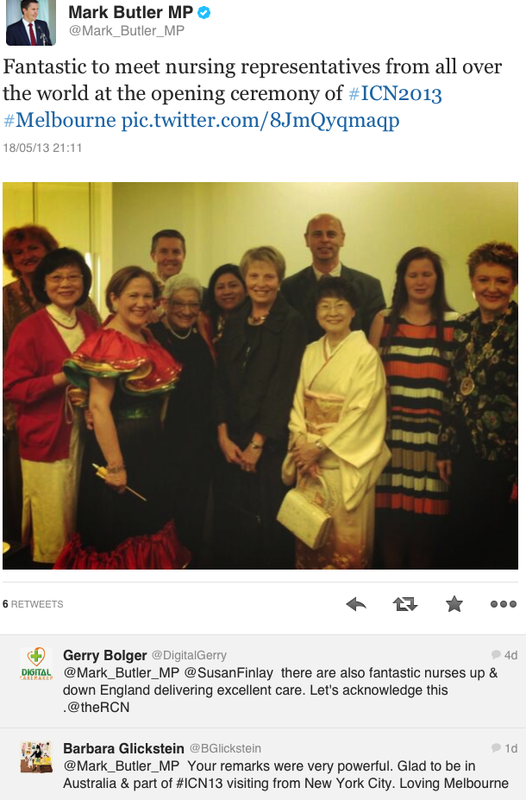 Thanks to all the Tweeting delegates at the International Council of Nurses 25th Quadrennial Congress. Your tweets entertained, enlightened and amused, and made virtual attendance a pleasure for those of us who couldn’t attend in person. Please encourage any healthcare conference organisers and/or healthcare Twitter novices to visit these sites. 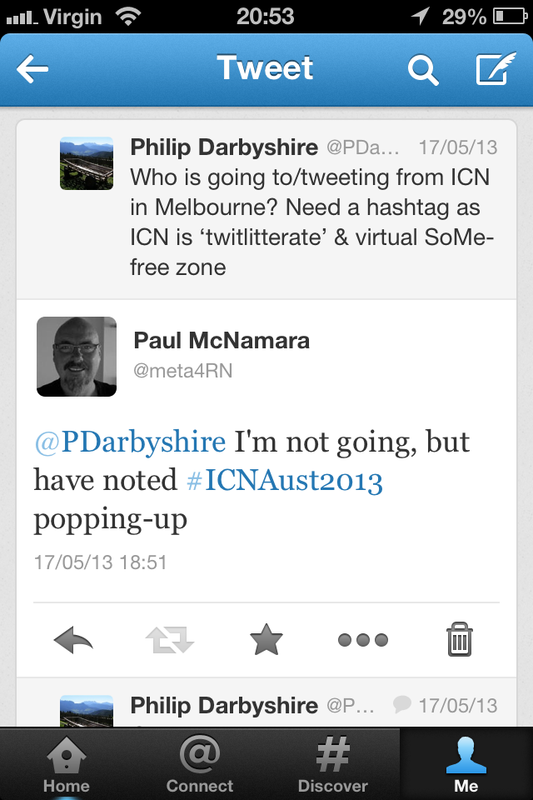 For impressions of the conference from someone who actually attended in real life, please see Philip Darbyshire’s review ICN Congress, Melbourne 2013: Fantastic or fizzer? and his photo gallery here. Sorry about rambling-on so much; as always, your constructive comments are welcome. This entry was posted in Blog and tagged #HCSMANZ, #SoMe (Social Media), geeky stuff, nursing, Twitter on 25 May 2013 by Paul McNamara.